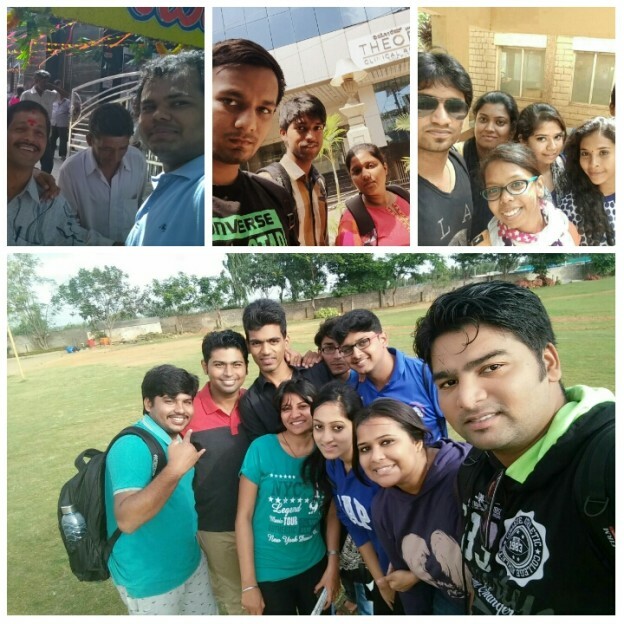 When the city was waking up on a cool Sunday morning, three out of ten in our group were ready to backpack across the town to find movie theatres as a part of the Personality Enhancement Programme(PEP). The objectives were threefold, first to find as many movie theatres as possible and click a groupie with the theatre behind us, secondly to spend the least amount of money within the given time frame and lastly a presentation of the journey. to joins us for a groupie, their happiness knew no bounds. And while leaving ,when one of the elderly hugged and thanked me for coming down to the theatre and considering them for our project, it dawned on me that complementing the cool and pleasant weather was the warm hearts of the natives of Bangalore which gives this city its exceptional popularity. After covering a dozen or so theatres in north Bangalore we rushed towards our college for the final leg of our project – the presentation. From begging to borrowing we did all it took to put up a presentation. The tension was building up not because we wanted to win, but for the fact that we wanted to do justice to a city which took care of three strangers, as its own. Completing the presentations and putting it up on time I did my part on giving the city the respect that it deserves and the love that it never demands.